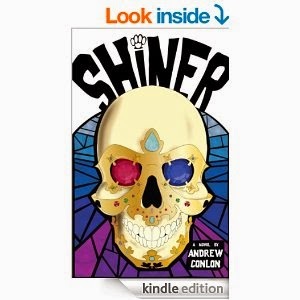 Andrew Conlon is a writer of drama, horror, and suspense fiction. SHINER is his first novel. "While I was growing up, I lived in what I still believe was an extremely haunted house. Frightened and fascinated by my experiences, I sought answers, and by the time I was a teenager, I had read hundreds of tales about paranormal phenomena. My interest in the paranormal, supernatural, and strange has continued throughout my life and I have often been a confidant of friends and family who know that I believe the paranormal actually occurs in the "normal" world, so some people have entrusted me with their most secret, scariest stories, which has vastly influenced my work as a writer of paranormal fiction. Then, in 2010, I moved into the same neighborhood as the haunted house of my youth. While living once more in my childhood stomping grounds, I investigated the local history and places - which include a number of spooky cemeteries, Native American burial grounds, a seemingly haunted forest, and other odd features - and found that I wasn't the only one who'd experienced paranormal phenomena in area. Almost everyone had a scary story to tell. Drawing from my experiences and all of the ghost stories I have collected over the years, I was inspired to write my debut novel, SHINER, a paranormal thriller about a teenage boy who must learn to fight the evil in his haunted house."